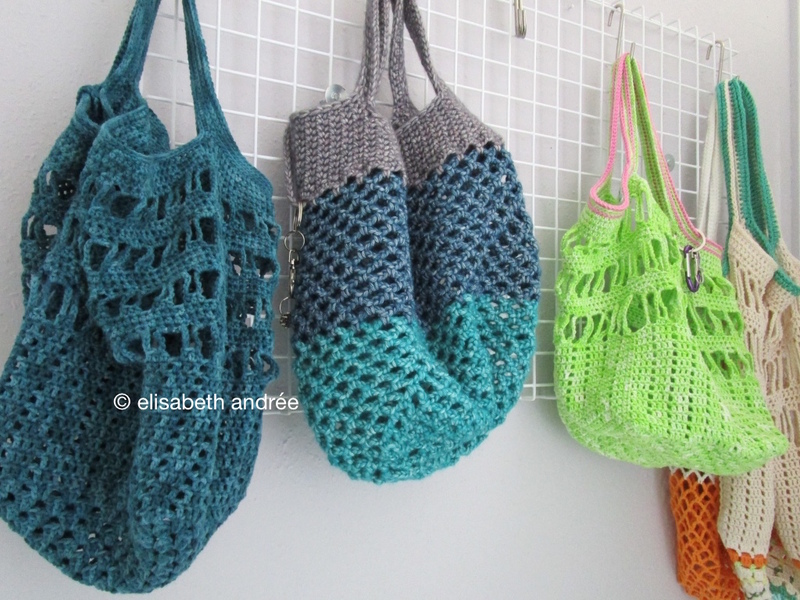 here are some pictures of two finished small crochet bags, one for my sister in law and one for me. they are made of look a like yarns, but it are different labels and the green is somewhat thicker than the teal colored one. the details are different too. 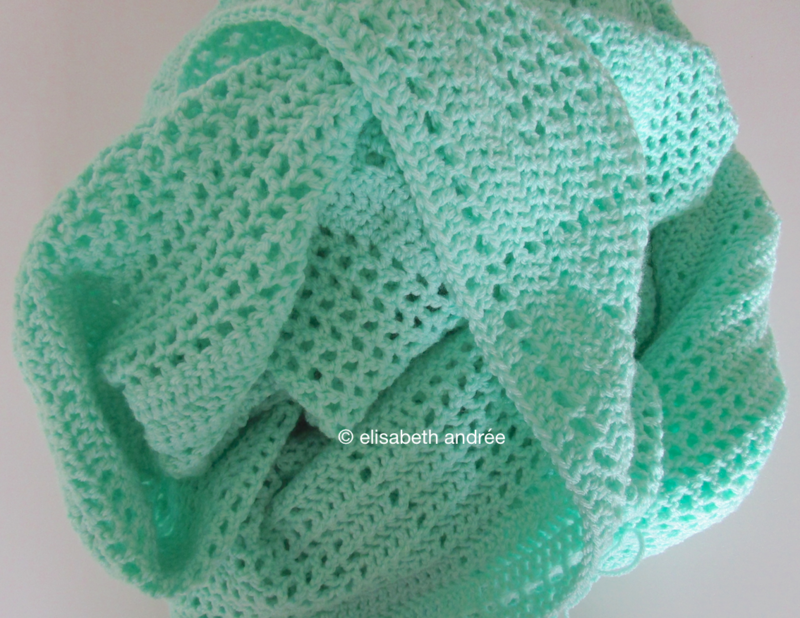 the green is cotone of lana grossa and the teal is sunkissed of scheepjes. the secret project is finished too, it is washed and drying at the moment. once the project has been received by the person for whom it is intended, i show you proper pictures. there was no time this week to work on the orange blanket, but hopefully i will be able to pick up that project tonight. hope the rest of the week will be wonderful for you! 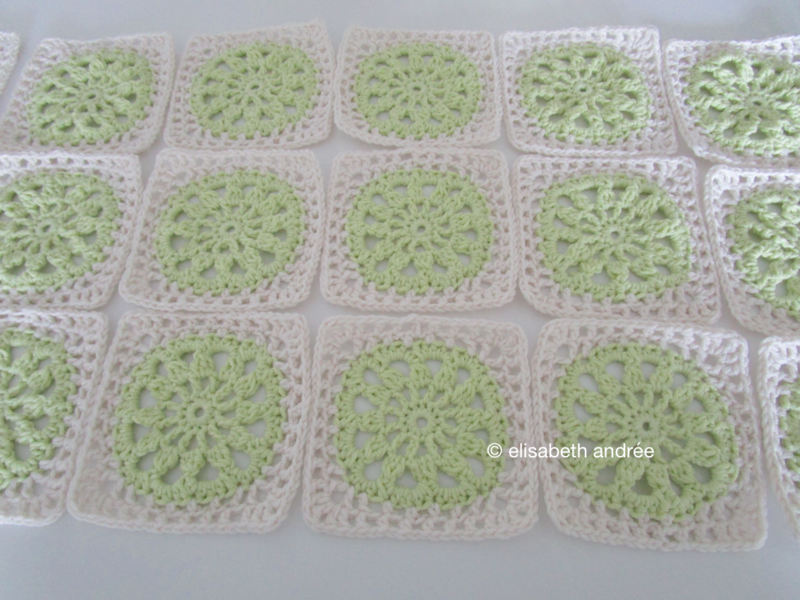 Categories: crochet, project done, wip | Tags: bag, colors, crochet, crochet bag, crochet stitches, green | Permalink. last monday, i have posted a brief explanation of how to make a variation on the ‘another square’, see here. … and for some of you that might be a little boring to see. 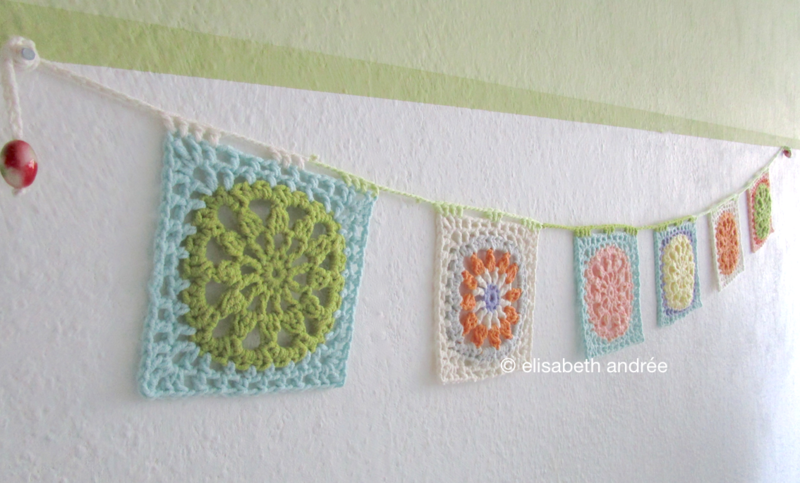 so i have made up a few blocks in multiple colors and turned them into a small bunting. the squares are blocked and nicely flat. when you don’t block the squares, the center will be a little higher than the border. do you prefer the festive version more or the green-white version? if you want to crochet the square too, this is the link to the ‘how to’ for both versions of the ‘another square‘. Categories: crochet, tutorial, wip | Tags: block, blocks, bunting, colors, crochet, square, squares, tutorial, wip | Permalink. last week i have not worked on my opaline blanket, but i have done a few other things. one project is finished and that is this lacy with dots cushion cover. it is made with three colors of scheepjes softfun. more info about the yarn you can find here and the pattern for the square here. this bag is finished too, the crochet work i mean, it needs a lining but so far i didn’t find a fabric i like. the bag is made with cotton 8 of the label scheepjes (info here), lovely yarn although it is a little thinner than the cotton 8 i’m used to of other labels and therefor it is not really suitable for making bags (i think). the result is a bit baggy hence lining is needed. last night i tried a vintage pattern, i’ve pulled out the last few rows because the square was getting wobbly and crocheted a modified fifth row and this is the result. i am not a great lover of bobbles (except for edges) but i love this square! the pattern counts 7 rows, it is free available here (scroll down for the picture of the square) and it is an easy to follow description. well, that is all i have to share this week. Categories: crochet, project done, wip | Tags: bag, blanket, block, colors, crochet, crochet bag, cushion, cushion cover, free pattern, square, squares, vintage | Permalink. it’s friday and i hope you will enjoy the weekend! here are some pictures of the bright colored crochet nutty pillow that i started september last year, more info here. this week i finally completed the project. it is made entirely of leftover yarn. 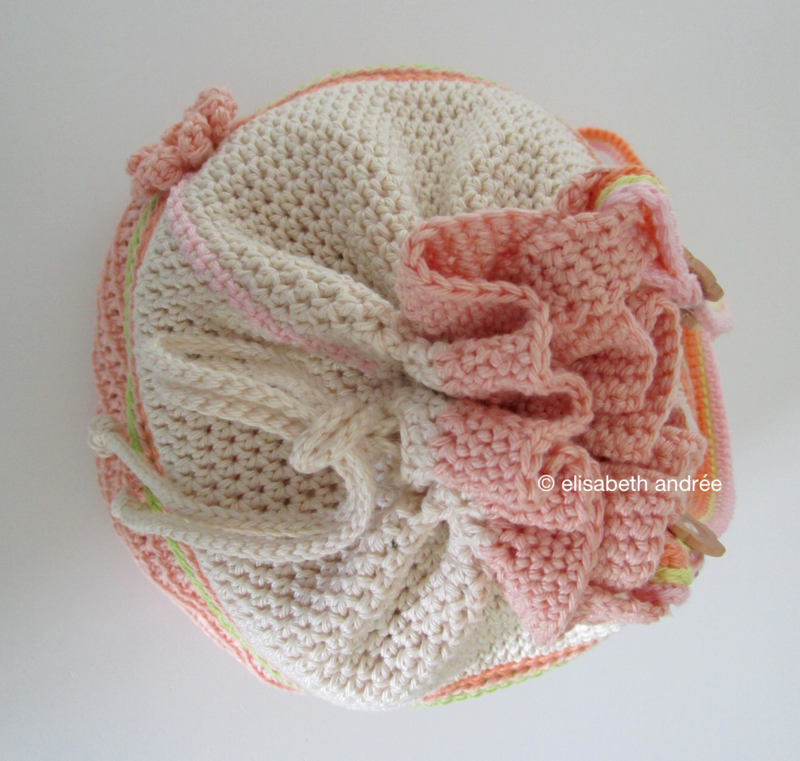 inside is a pillow made from an old duvet cover filled with leftover yarn, yarn ends and leftover crochet projects. i measured to find the middle on both sides and pulled needle and yarn through. the crochet cushion cover i washed and after it was dried, i have put the sewed cushion in it and i could easily pull the yarn on both sides through the center and attach the buttons, then i sewed the edge. the nutty pillow is a large floor cushion of almost 90 cm in diameter, it feels like a comfortable mattrass and i designed it for two cats to relax and sleep on it. i hope they like the neon details! Have a lovely weekend and until next time! Categories: crochet, project done | Tags: colors, crazy yarn, cushion, cushion cover, floor cushion, pillow, yarn, yarn leftovers | Permalink. 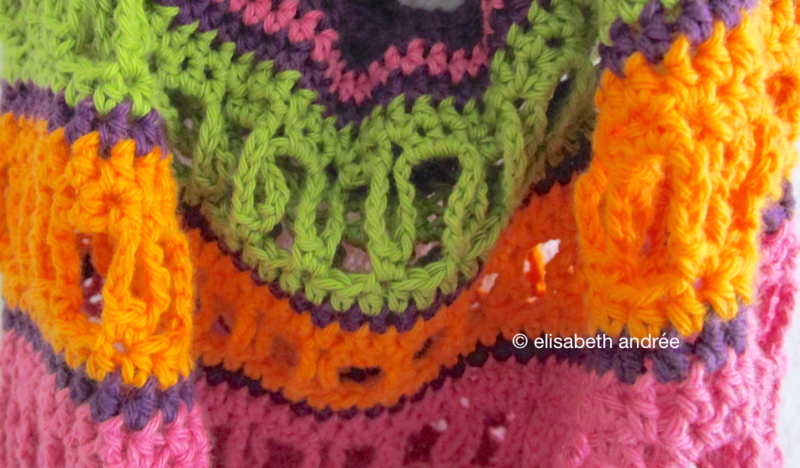 we are halfway the week already, time to show some crochet work. still working on my opaline blanket, it is 8 blocks wide and almost 7 block high, that means 1 row of blocks to go. next i will start with the border and thereafter it is finally time for the embellishments. last week i made a small bag of a leftover square and i think/hope the youngest daughter of friends is interested in it. here are some photos, hope you like to take a look at them? hope to see you soon, thanks for visiting! Categories: crochet, wip | Tags: bag, blanket, block, blocks, colors, crochet, crochet bag, crochet blanket, shoulderbag, wip | Permalink.